Update: To anyone who commented on my previous post(s), sorry if you do not see your comment. =( I accidentally hit "delete" instead of "publish." I feel so lame! Sorry to those affected! The mid-August-gloom has made me reach for a darker palette in my closet and has also made me feel a bit lethargic. I often mix up patterns in my outfits and I am kind of shocked I haven't paired this polka dot shirt with my starry-print skirt yet. 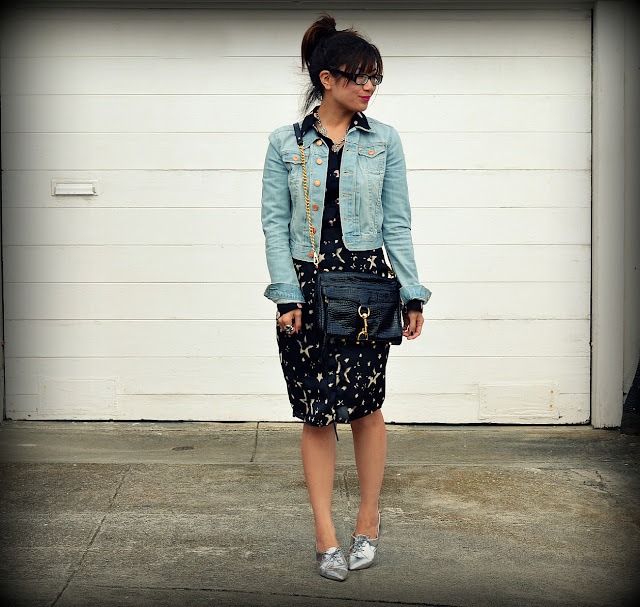 To keep up the laid back vibe and offset the darker colors, I chose my silver flats from Zara and my trusty jean jacket. To be frank, I was feeling a bit lazy and dressing in darks is an easy way for me to feel like I made a slight effort in my outfit. Do you ever feel that way? August "gloom" is great inspiration apparently hee hee as I adore this entire outfit! The great necklace, the shoes I want, want, want and adorable print skirt! It all looks great together! Great dress! I like it dear! Dark dressing can definitely be chic, and you've certainly accomplished that. You look relaxed yet pull together. Just fabulous! hey, these photos are adorable! i love your outfit. that dress is so cute and the print is wonderfully unique. but i think your awesome styling is what really makes this outfit. the denim jacket adds a casual vibe, and i adore the jewelry that you wore. 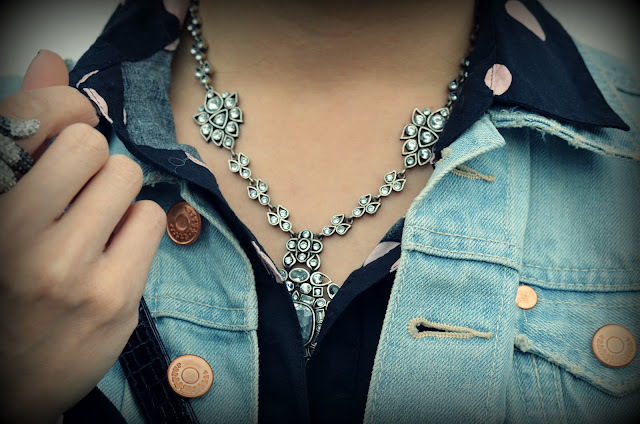 your accessories have this amazing vintage feel that gives the outfit a really unique vibe. you look lovely and your style is so enviable. will definitely be checking back in to see more of your posts! Loving the pattern mixing! Looks perfect! Love the print of your dress! You look so cute. I love the print of that skirt and the pattern mixing! I have this great blazer that makes me feel "put together" no matter what I'm wearing--so useful on those days where I just can't figure out what to wear! 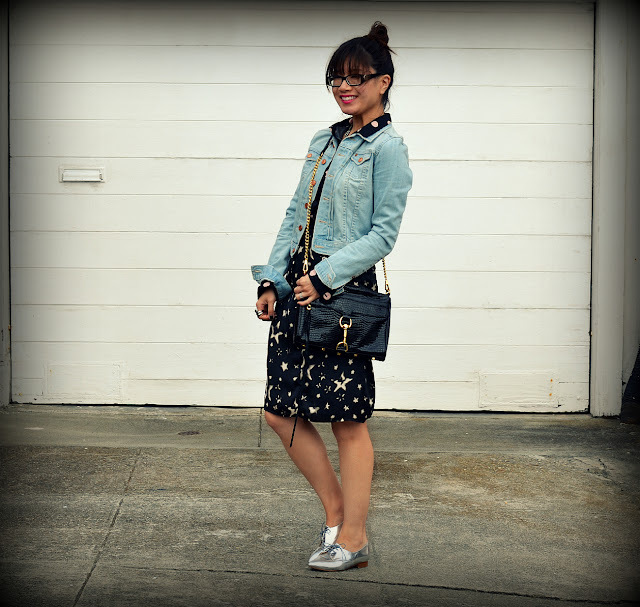 Your version of "lazy dressing" is way cuter than mine will ever be! I love the whole look because of all the interesting details mixed together. And of course, those silver flats are killer! 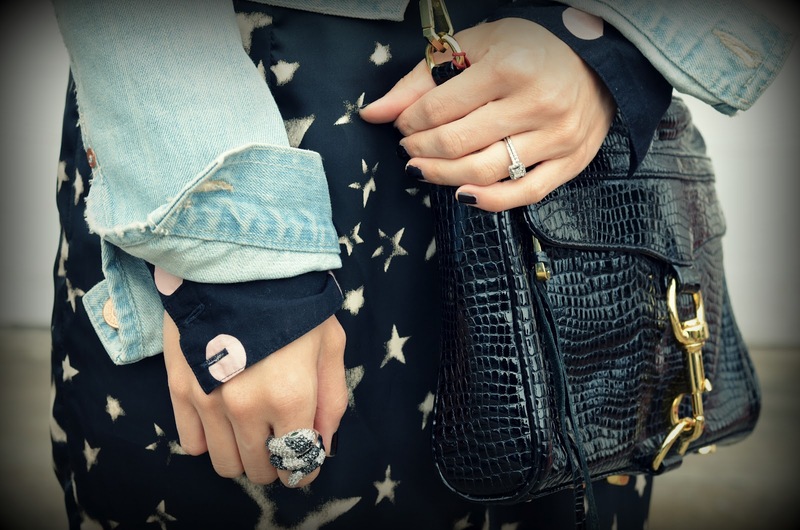 Oh I want minkoff too, they are gorgeous and love the denim combination dear, Following you on bloglovin dear. Lets keep in touch! i absolutely love this outfit! love the denim jacket with the dress. Nancy I love your mixed prints! The star-y print is great. So happy you visited my blog because I was able to find yours! Do you want to maybe follow each other? Great outfit! I like those silver shoes. Love your whole outfit the print of the skirt is amazing! You look beautiful! 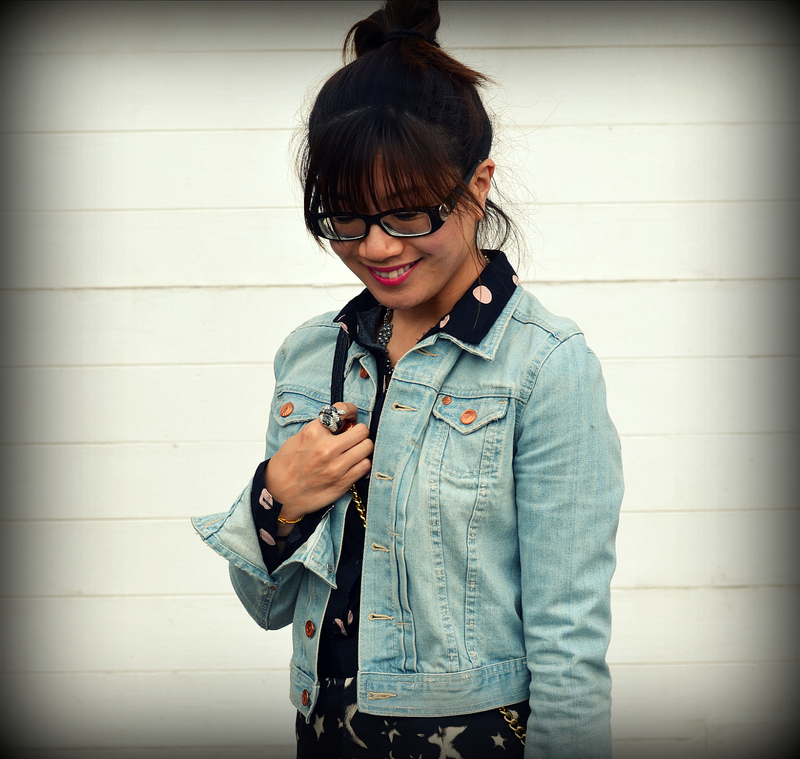 loving the mixture of prints and textures. your skirt, top and jacket look great together. you definitely know how to accessorize. love the print of your dress, and that rm bag is tdf!! xO! This is you lazy? I think it's great! I love the layering and your star print dress is just adorable! Gorgeous! I love the star prints on your beautiful dress and your necklace...and your ring(s)... ALL of it actually! What a gorgeous look, you loo adorable! 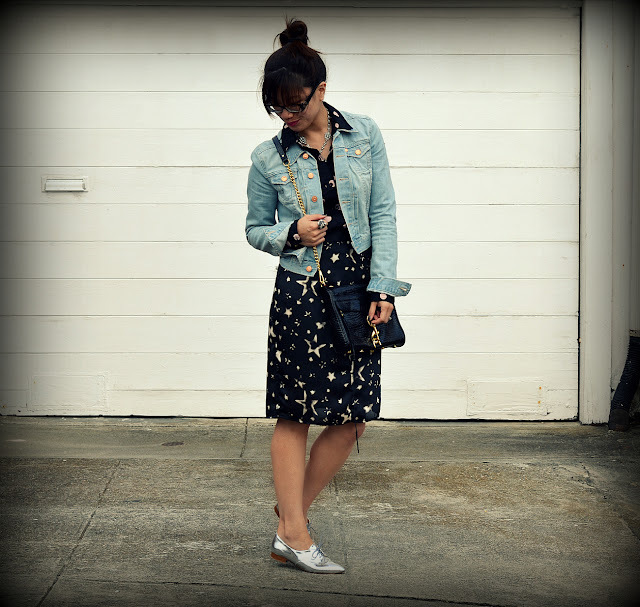 Digging the polka dots and stars together – unexpected but works so well! Also love those silver oxfords, so cute. Love the shoes you paired with this outfit!! Hey, we all have lazy days :) But honestly, I don't know why you think this looks like a slacker outfit...those silver shoes and that stunning necklace are really awesome! I love the pattern mixing! The print on that skirt is awesome!